Protesters from every borough gathered for a monthly action in front of Gracie Mansion. One seething speech after another—in Chinese, Spanish, and English—rallied against Mayor Bill de Blasio, declaiming his affordable housing plan as a sell-out to developers. He’s worse than Mayor Michael R. Bloomberg, they say, for having promised more. The 21 groups that make up the Citywide Alliance Against Displacement are united in opposition to the de Blasio administration’s Mandatory Inclusionary Housing and Zoning for Quality and Affordability (MIH-ZQA) initiative, which seeks to impose affordability requirements on certain categories of new residential development. They have one thing in common: They abhor new residential construction of any kind. Squeezed by rising rents, they say the small number of new affordable units produced by the existing model of luxury-tower-subsidized affordable housing come at the expense of rent pressure on everything else around it. Among the most vocal, well-organized, and populous opponents, the Coalition to Protect Chinatown and Lower East Side has a special grievance. In 2008, much of the predominantly white East Village won relief from as-of-right development through a “contextual rezoning” that significantly limited bulk along most side streets, but excluded ethnic enclaves in nearby Chinatown and the Lower East Side. Little Italy is protected by a special zoning district. Tribeca has a special mixed-use district. Soho has a historic district and national landmark status. But Chinatown survives in the absence of any special protections. Since 2002, it lost nearly one-quarter of its rent-regulated apartments, threatening to alter the character of one of the city’s most distinctive cultural districts. The 53 member organizations of the Chinatown Working Group spent six years negotiating a comprehensive plan emphasizing preservation of affordability and neighborhood character. But in meetings with de Blasio’s City Planning Commission, officials rejected its zoning recommendations as “too far-fetched and too ambitious,” according to Jei Fong, an organizer at the Chinese Staff and Workers’ Association. Completed in December 2013 by the Pratt Center for Community Development, the plan recommends the creation of a special-purpose district for the historic core of Chinatown and its expanded area north of Canal Street. The district would use downzoning to C-4 with 85 height limits as one of the tools to preserve what makes Chinatown unique, to mitigate residential displacement, and to protect neighborhood small businesses from being priced out. “We were given those three mandates that were essentially, how do we preserve what we feel is valuable—the people, the businesses, and the culture—and where can we provide growth, while we preserve that which is important to maintaining Chinatown as a unique place,” said Hanhardt. On the surface, the image of Chinatown appears unchanged, crowded with tourists, restaurants, bakeries, fish sellers, novelties, and herbal apothecaries. 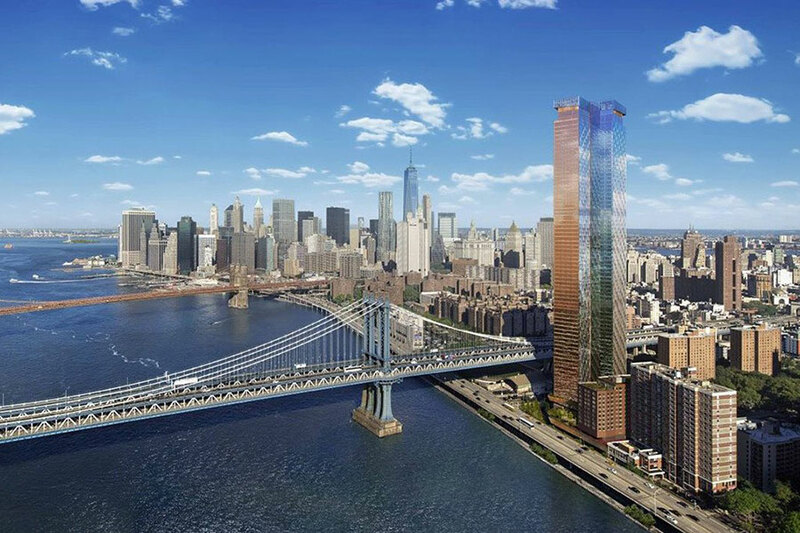 Yet residents see the dangers looming everywhere, symbolized most poignantly by a particularly ludicrous luxury tower being developed by Extell on the East River just north of the Manhattan Bridge. Designed by Adamson Associates Architects, 252 South Street makes use of as-of-right bulk regulations to achieve an 800-foot height without requiring discretionary action. It’s marketed as a “vertical village” with “epic views” starting from $1 million to $3 million, offered exclusively to overseas buyers in China, Malaysia, and Singapore.